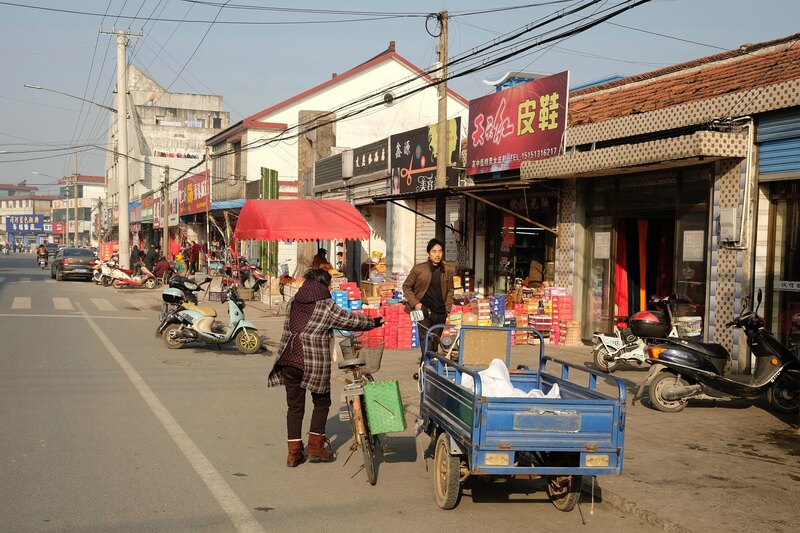 The main street in Jiaoxie is a hive of activity with small shops and restaurants spilling welcomingly out onto the pavements. 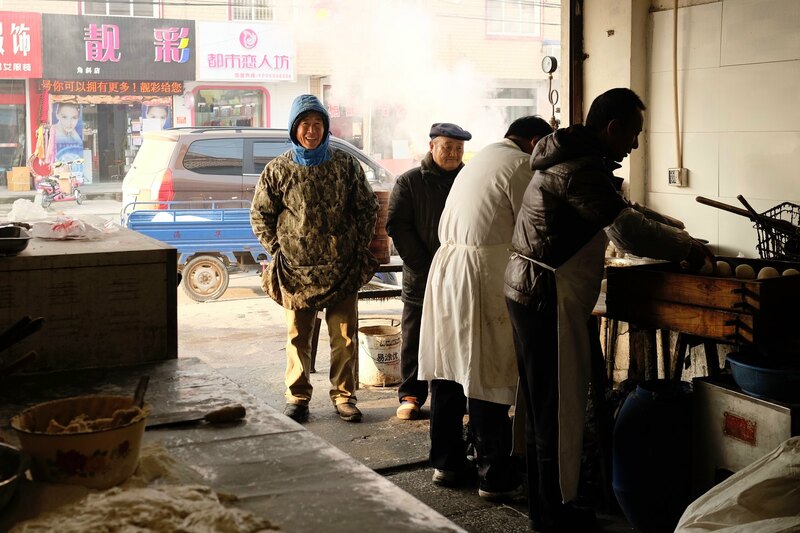 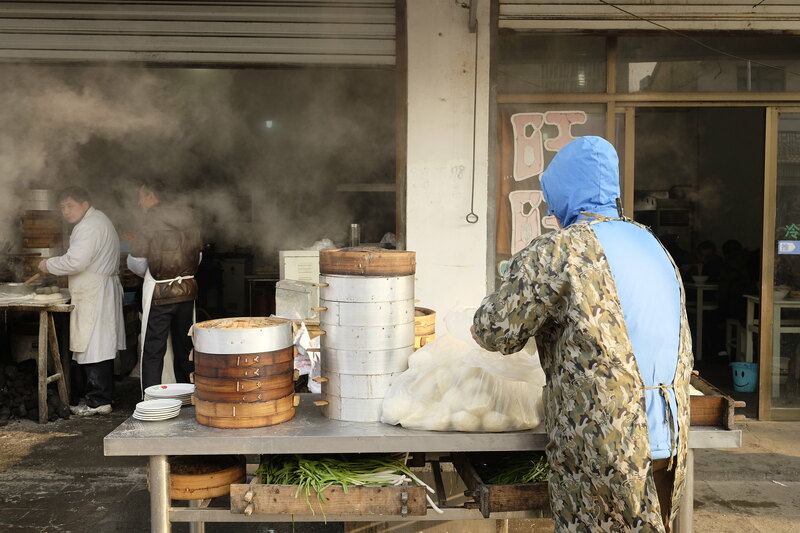 Run by Mr. Wu and his extended family, one such establishment is Wang Wang Breakfast (旺旺早点), where tasty buns, wonton noodles and flatbread are the order of the day all year round. 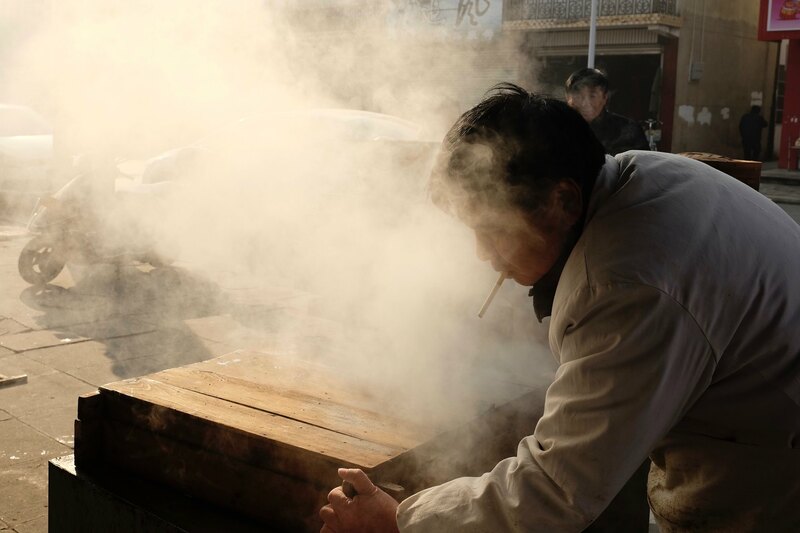 Work begins early for Mr. Wu who starts preparing at 4am each day, not particularly fun in the sub-zero temperatures during winter. 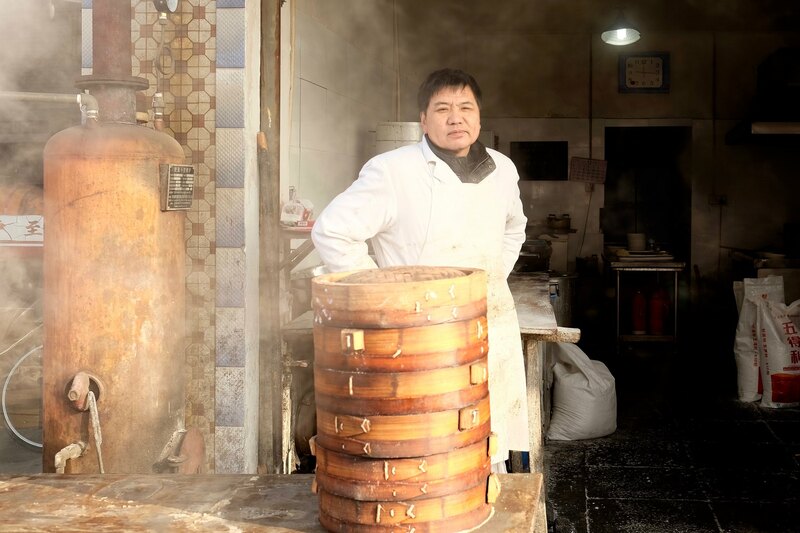 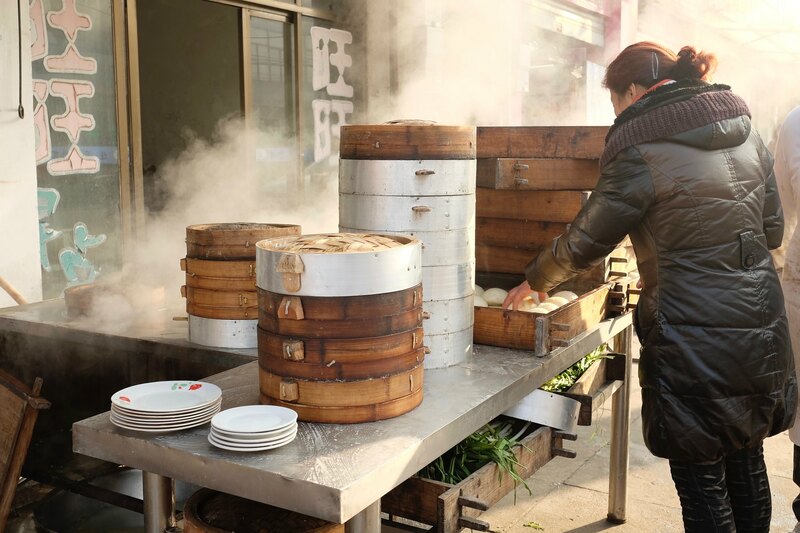 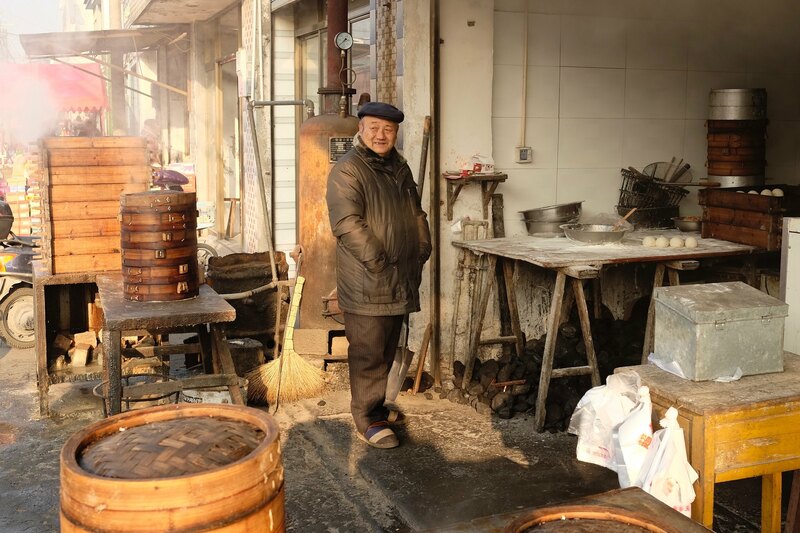 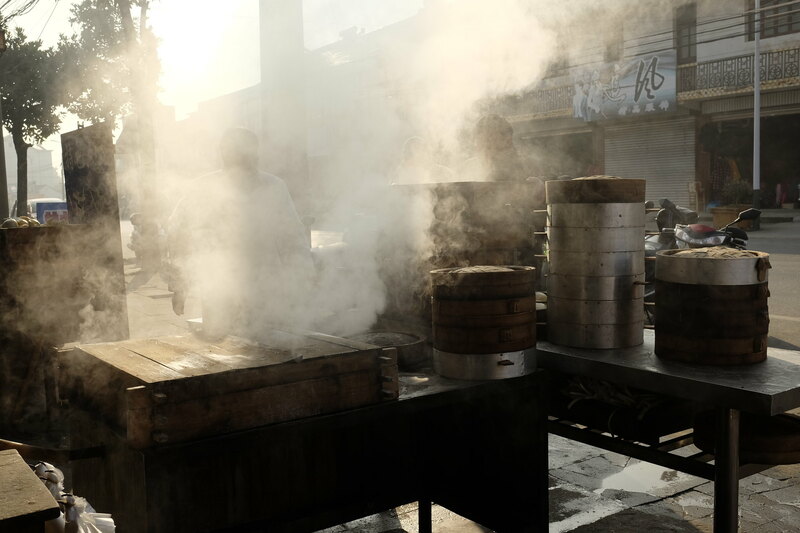 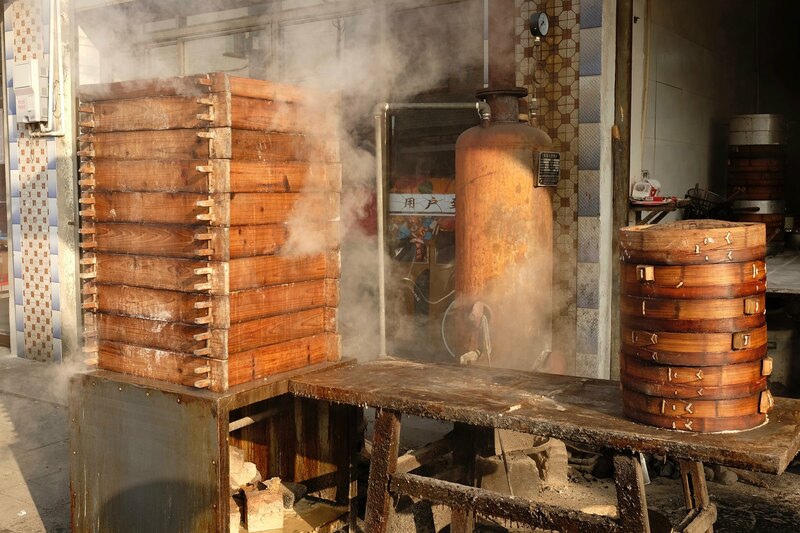 Piled high on tables dripping with condensation, savoury buns cook in wooden and bamboo steamers powered by a coal-fed boiler. 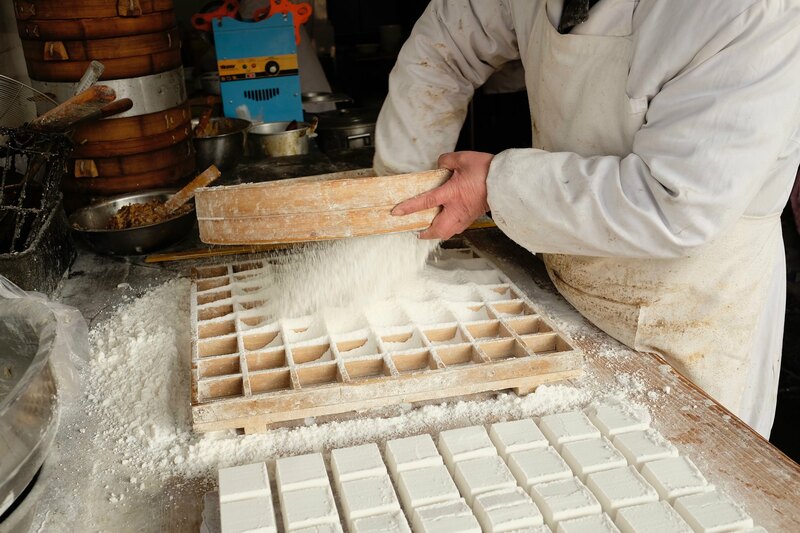 Everything is made by hand and, while the tools might be basic, the skills and techniques required have been honed over years of experience. 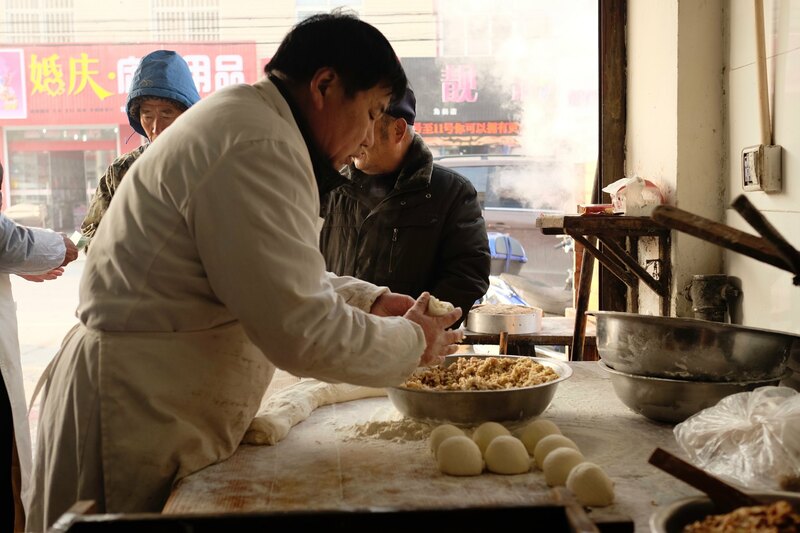 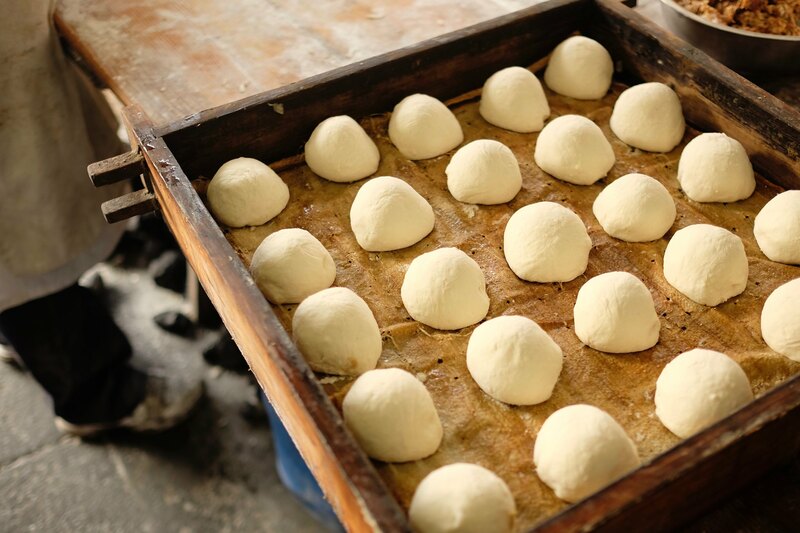 Watching Mr. Wu form each lump of dough into a precisely formed bun is almost hypnotic! 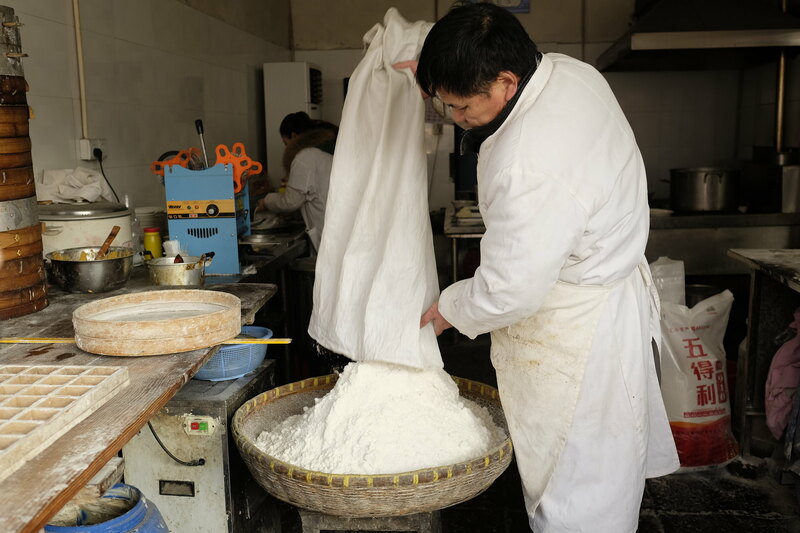 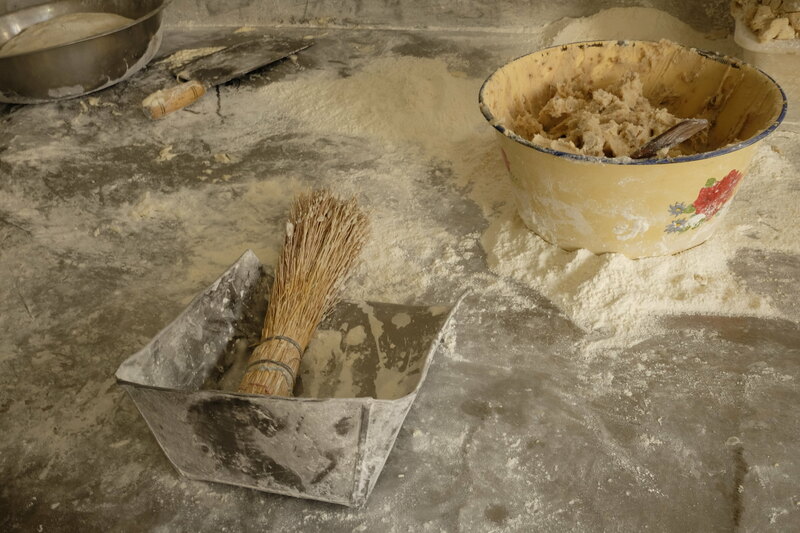 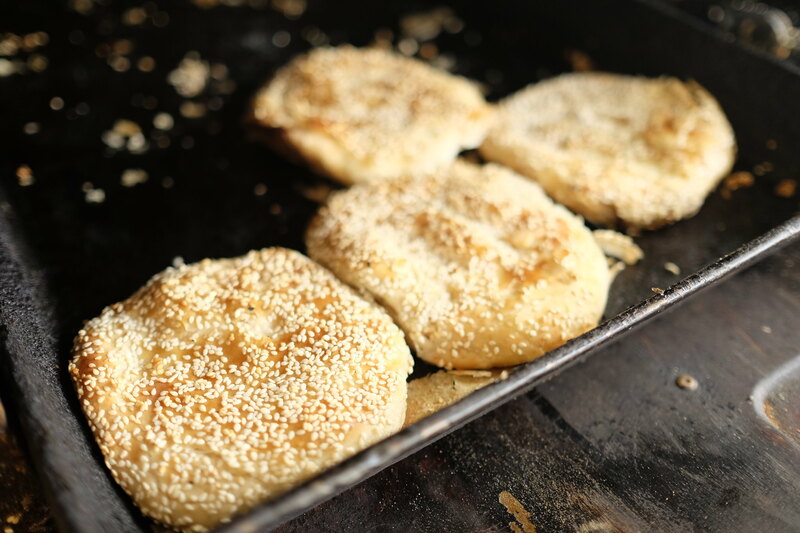 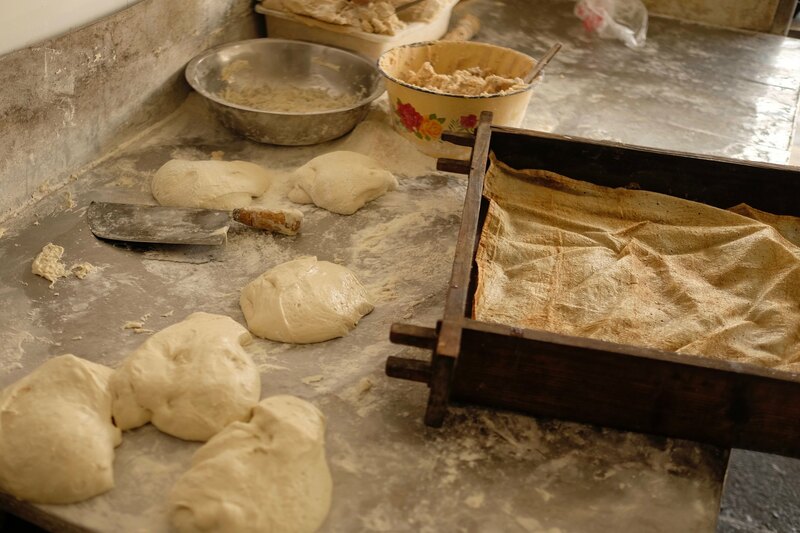 Flour, lye (used as a tenderiser) and minced pork are the main ingredients required. 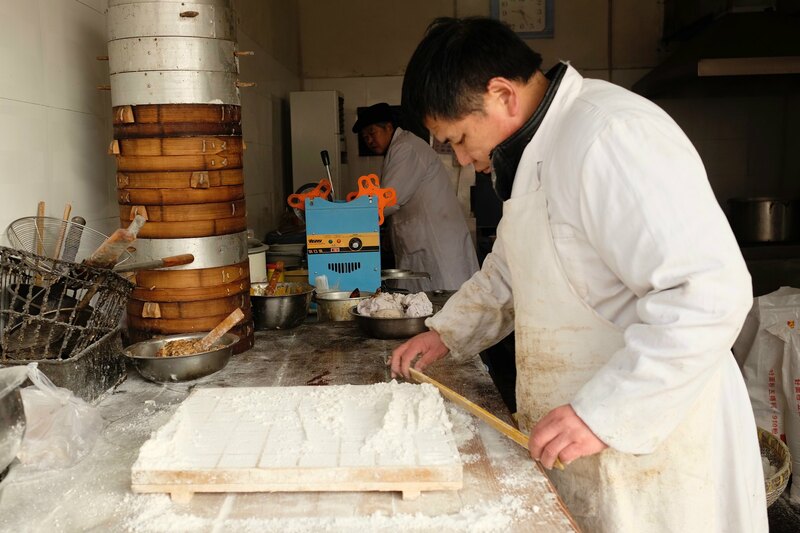 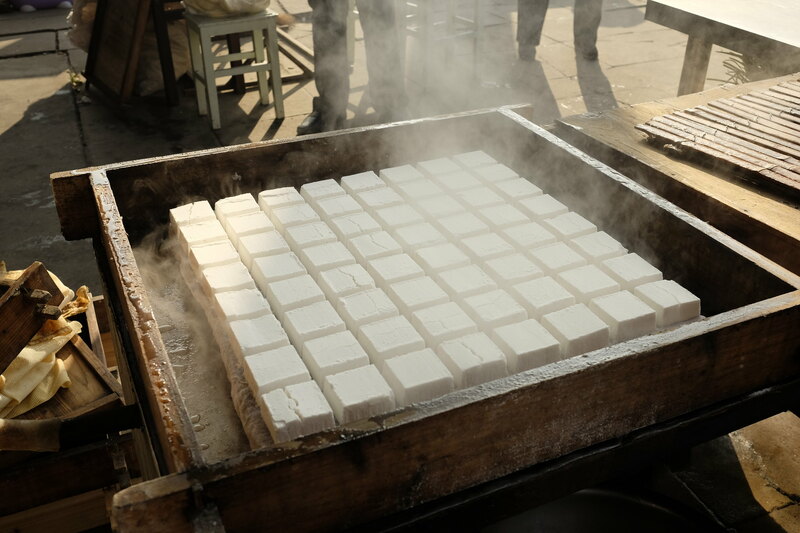 Nian gao (年糕), a type of rice cake, is made by mixing rice with glutinous rice and then steaming to cook. 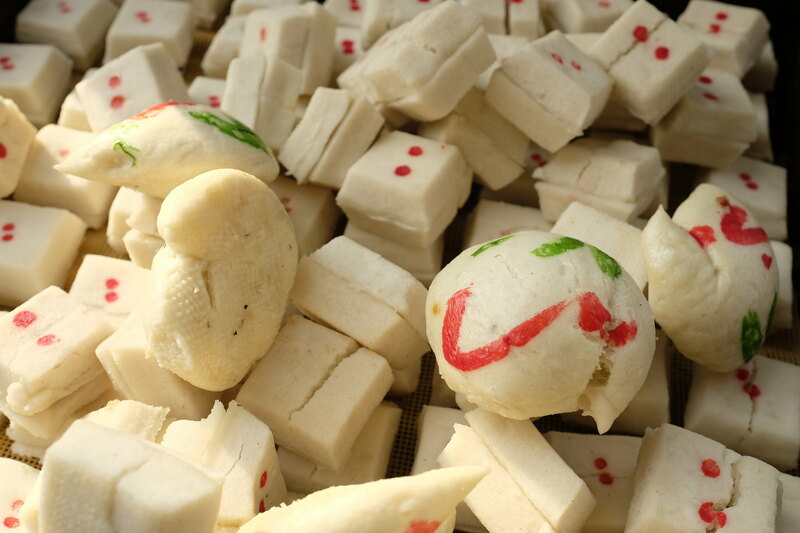 It is considered good luck to eat nian gao during Chinese New Year, because “nian gao” is a homonym for “higher year” (年年高升). 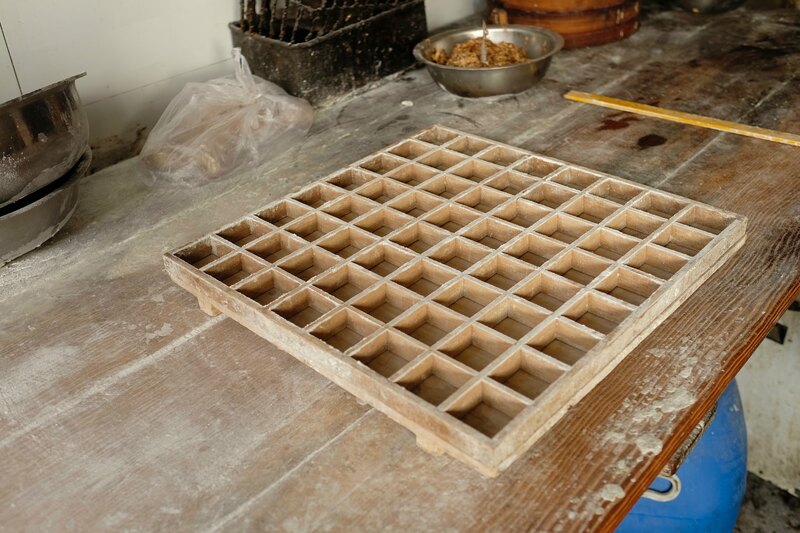 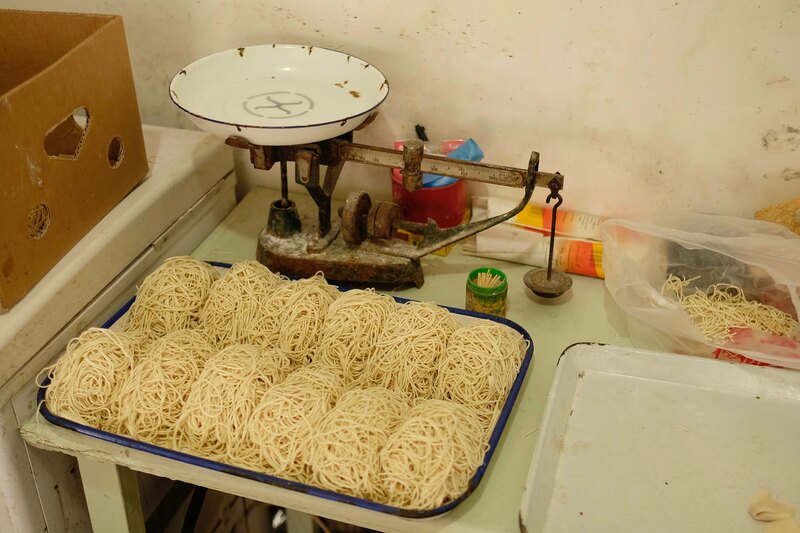 A wooden grid is used to form the rice powder into squares before placing on a damp cloth to steam. 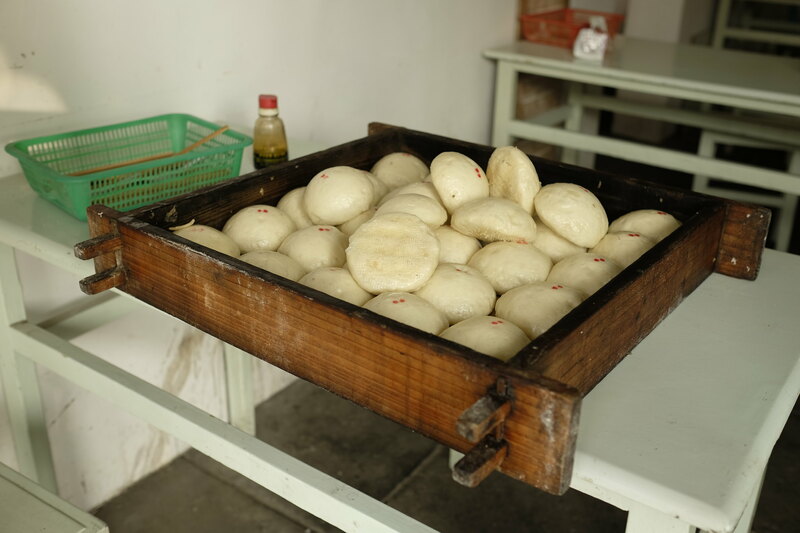 Sometimes they’re filled with sweet red bean paste. 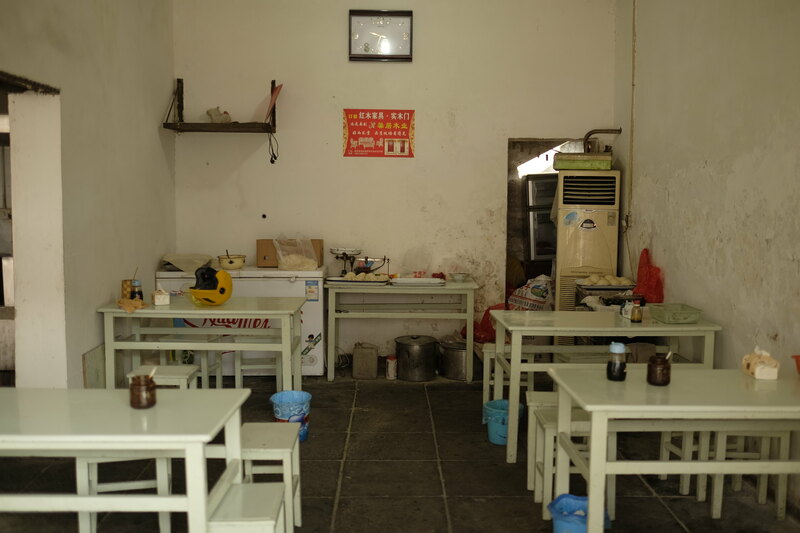 Inside a few wooden tables and stools are provided for customers. 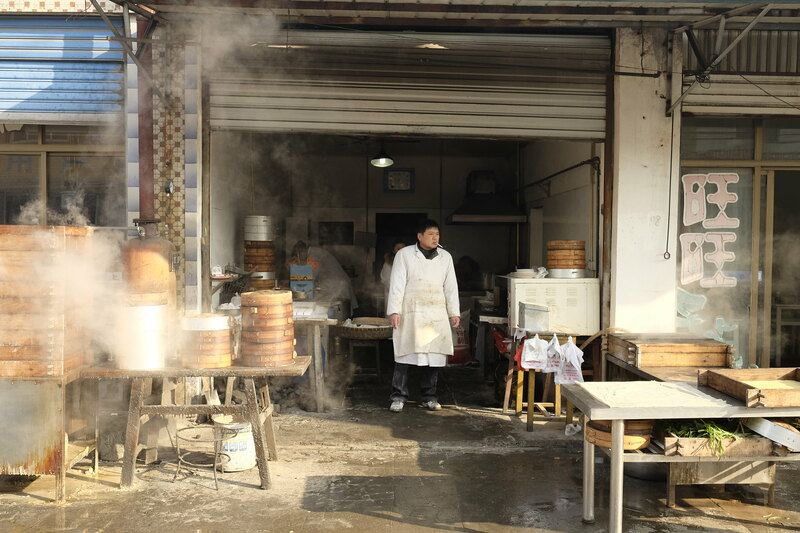 Note the jars of homemade hot chilli sauce! 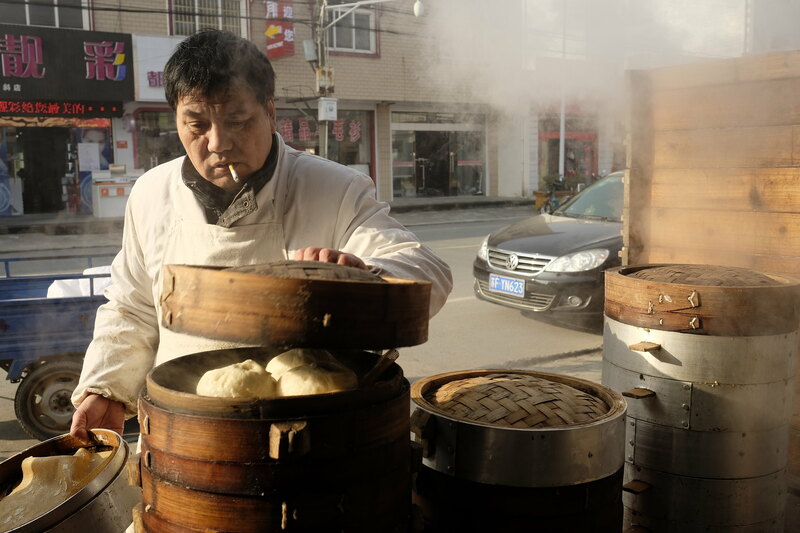 The restaurant is particularly busy just before Chinese New Year with customers stocking up on special shoutau buns. 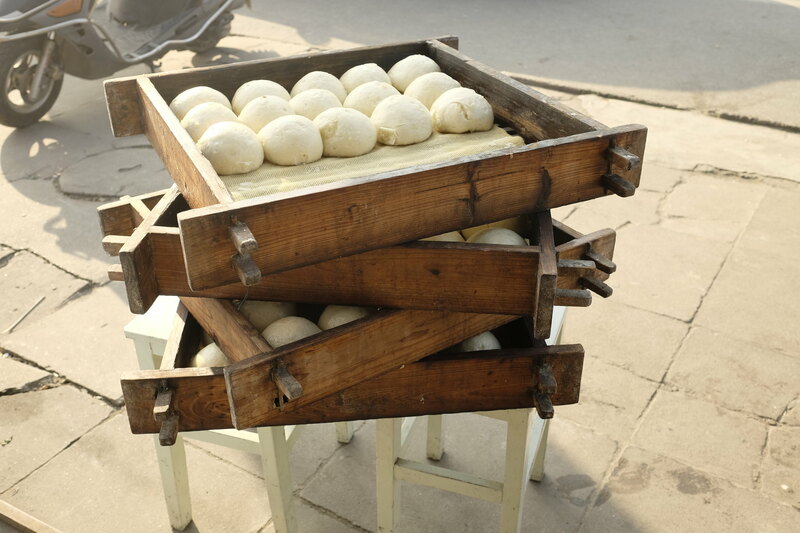 Translated into English, shoutau (寿桃) means “peaches of immortality”, so called due to their mystic virtue of conferring longevity on all who eat them (a common theme in Chinese art). 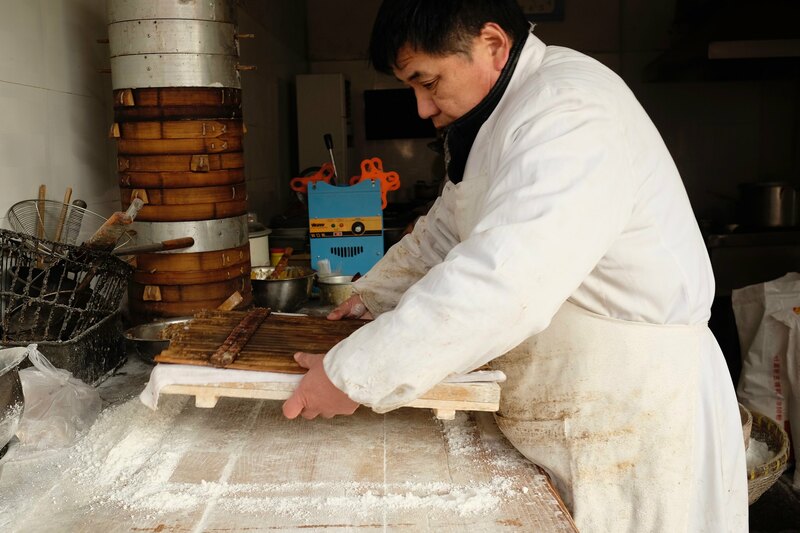 In the popular Chinese fantasy novel Journey to the West, the Monkey King is stationed as the Protector of the Peaches and ends up stealing one in order to prolong his own life leading to much mischief!